When I was a kid my mom use to tease that she thought I’d be coming home from kindergarten asking to nurse. I’m child free but I always love to hear breastfeeding stories. Thanks for the happy memory and happy birthday to Elliot. He sure is starting to look like Meg. What a handsome young man and you nailed the sweater! Elliot sounds like a very charming child, all those pleasantries to his personality. As to the mashed potatoes ….. they are one of the greatest comfort foods known to man! He just hasn’t met mashed taters done right! Beautiful love letter. 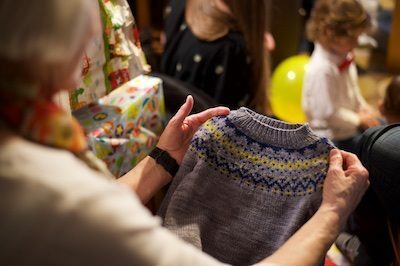 Beautiful sweater. Beautiful boy! All blessings to you and yours, Elliot. Clearly, Elliot is perfection in a child! He expresses joy so well! Thank you for sharing the light of your life! What a sweetie! Awesome sweater, too! I love BFL. I was going to say that little Elliot has little old man hair… and that it’s absolutely charming! He totally rocks it! Aw, he looks so sweet. I barely had a hair on my head before I was three and I turned out ok (mostly)…don’t you worry, little dude. Me too on the late hair growth, and my youngest had the same trait. When it did come in, we both got fine-textured naturally curly hair. Happy Birthday Elliot! Never let anyone give you a hard time about not liking mashed potatoes. I don’t like them, and neither does my niece, and she is 36 years old. We’re in it together. What a CUTIE and a sweetheart! Happy birthday to Elliot!!!!! My brother wouldn’t eat mashed potatoes unless my mother dyed them green when he was little. Now that’s just about all he eats. 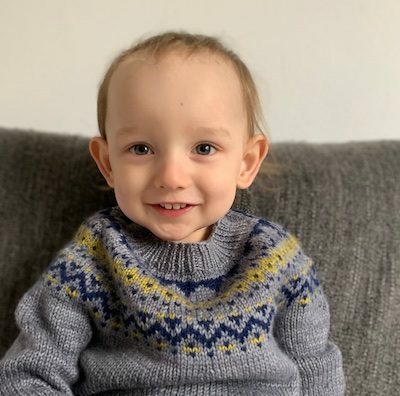 Oh my word, how adorable and what a sweet little man you have there, the sweater is also amazing. Happy birthday, Elliot! I had hoped that we could be besties, but your disdain for mashed potatoes makes that iffy now. Here’s to many more train-smashing days for you! Darling boy, beautiful sweater. Happy Birthday Ellliot! What a little sweetie. He sounds like an old soul. What a cutie! Except for the sweater part, let’s clone him or somehow spread his genes widely about! You go, little boy! Stunning from start to finish and Elliot is growing into such a lovely human being, I look forward to future stories and photos. That sweater is stunning, you knocked it out of the park! The sweetest birthday letter ever. Happy birthday Elliot! And I am totally with you on those mashed potatoes! What a darling. Elliot is growing up so fast and is a charming boy. 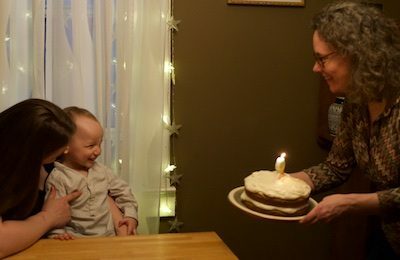 Happy two year birthday, Elliot. Lovely sweater. I’ll be 66 in a couple of weeks and this is the first time I’ve heard of people not liking mashed potatoes! Happy Birthday, Elliot!! If he isn’t the cutest! What a beautiful smile and his eyes are such a lovely blue. Happy Birthday Elliot, may your year be filled with laughter. Don’t worry about the hair, little man. At least nobody tapes bows onto your noggin for pictures. Oh yes! I had bows taped to my head too. Then, when it grew finally, it was so thick! But still straight and fine. Yeah … my mother says she was tempted to sellotape (scotch tape) bows to my haid too!!! How precious is a grandchild. Elliot looks so happy in that sweater! I am pretty sure he will get many days of wear and warmth yet this year. I love the pattern. I must see if I can figure out how to make a bigger size. Thanks for the photos and a peek at Elliot. Look at those legs! Getting long! I miss nursing my littles in the night! Nothing can compare to the sweetness and connection – it is the very best thing. Oh, the love of a grandmother! Thank you. He is such a precious wee little man! I’m so glad to hear of all the joy he is bringing to your family. In the wake of the losses of the recent years, it sounds like he came along at just the right time! What a cutie! Happy Birthday Elliot! That smile would have even the worst cynic have a great day. Happy Birthday. Happy, happy belated birthday Elliot! What a sweet boy you are, and so lucky to have such a wonderful family. Wear that Yarn Harlot sweater with pride! Aren’t grandsons the very best in the whole wide world lol!!!!! StephFriend, seriously, that child is just IMPOSSIBLY cute. I was thinking just the same thing about his lovely hair … it’s coming in nicely! 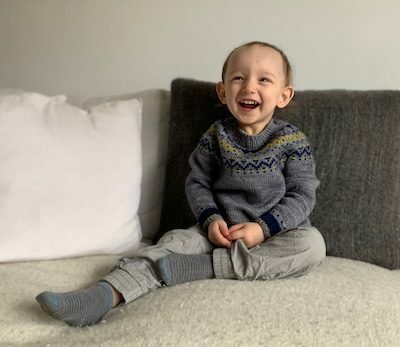 Do you ever get tired of compliments on the adorable cuteness and sweetness that is Elliot, or the super impressive fineness of your knitting? 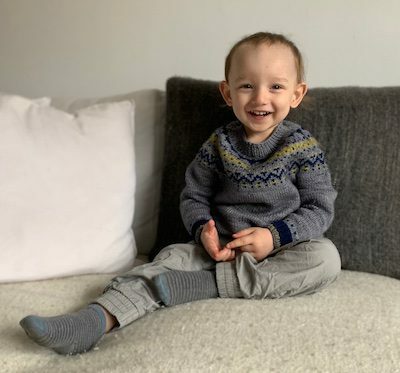 I sure hope not because both the boy and his sweater are pretty darn spectacular! I’m super impressed you got that great sweater done in a week while working too! My goodness he’s changed! What a lovely little man he is. 🙂 Happy birthday big boy! So fun to see how the sweater came out. It looks really nice on him. What a delightful human. Happy birthday, small person! 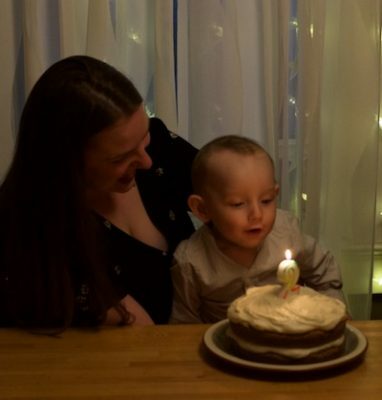 I adore all your stories about Elliot, and I adore all your open letter birthday greetings to all your clan, what an absolutely brilliant concept. Yay to the breastfeeding! Let bubba and mama decide when it’s Time, Please, Gentlemen. When it stops, it will be missed. Ohmigod, the joy on that face. I’m pretty sure the word No would completely leave my vocabulary around him. I made my grandson a cardigan for his 2nd birthday in November, it had a fire engine on the back, a train on one front, a tractor on the other, Harold the helicopter at the top of one side and a rescue helicopter the other. He paid me the ultimate compliment of not wanting to wear it because he just wanted to look at all the pictures and he couldn’t do that when it was on. By the next day he was happy to put it on and it’s now looking very loved. The sweater is beautiful. One day he will truly appreciate hand knits-its in his DNA. His winning personality and wonderful smile will no doubt get him very far in this life. There are few things that are in shorter supply in this world. What a sweet letter! He’s going to treasure these, and the sweaters, when he’s older. Just you keep on hugging that beautiful boy! Waait a minute. Is that the sweater you swatched and blogged about on April 1? You got it done, ends woven in, washed and wrapped in less than 12 days? You are a wonder. He sounds like a great little dude. My daughter would try anything at that age too. By three, she would only eat four foods, and she’s still the same at almost 18. So enjoy it while it lasts and feed him anything. What a wonderful post and gift to your family. My wiser, older sister said when my kid were little that you can always tell what kind of adult kids will be by the time they are 3 years old. The qualities of patience, kindness, sense of adventure, or lack thereof, etc, will carryover into their young-adulthood and adulthood. She told me that when her boys were teens and older teens. My kids were toddlers and babes in arms. Now that my babies are in their late teens and early 20’s… I agree. 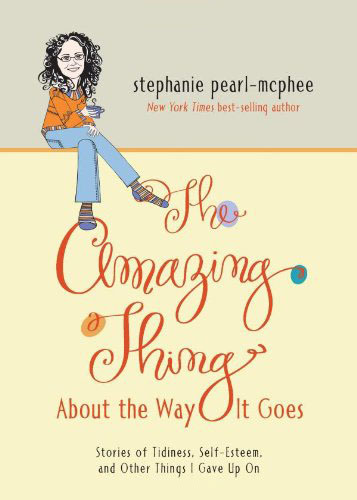 Such sweet, beautiful, lovely, funny, wonderful writing. Thank you thank you thank you. Best grandmother letter ever. Such a sweetheart! Can that incredibly tall boy be our Winston Churchill from 2 years ago? What amazing changes! Lovely sweater and amazingly fast work. Thanks for the lovely family letter to Elliot on his birthday – he sounds like a delight and not just Grandma’s blinders on! Wishing many more very happy birthdays to Elliot. PS – don’t worry about the hair. My grandson had only hair on the top for quite awhile, but has a full head of hair now. I have to admit that I’ve been rather jealous of Elliot’s willingness to eat all sorts of food given the selectiveness of my two littles. However, I feel better that it seems to be uniquely him and not some flaw in my parenting! So glad he is healthy and happy! Blessings on his next year!! What a very kindly and wise-looking little face. I can easily believe that he is all of the wonderful things his grandmother says he is. He is an absolute darling!! This post resonates with me in so many ways, I feel compelled to comment which I have only done one other time. My daughter was born a mere 24 hours before Elliot in exactly the same manner (via midwife in a beautiful water birth, minus the at-home part because we live in the US) and we also happen to have a Border Collie named Penny who looks exactly the same as Meg’s. Fast forward two years, and now me and my little lady are grappling with multiple night wakings to nurse. Weaning a two year old is difficult when they’re not ready, but I am choosing to get my sleep back over “partying through the night” so tonight will be day 3 of weaning. We haven’t made any attempts in the potty department, so kudos to Elliot for advancing in that area! All I can say is that I can feel for Meg and hope that it all goes well when they do decide to take on weaning.